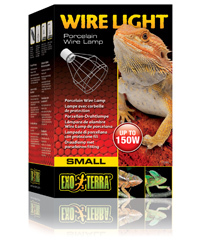 The Exo Terra Wire Light has a heat resistant porcelain socket designed to withstand up to 150 Watts. Ideal for use with Heat Wave Lamps (ceramic heat emitters), self-ballasted mercury vapour bulbs, and all types of regular incandescent bulbs. The wire guard prevents unnecessary heat build-up.